We now have an officially supported Windows 32-bit application for CPU and GPU crunching. If you have any issues with the application please post them here and I will do my best to address them. 11 hours with the new application out and seems like there are no issues! I am excited to see this. I will check back in tomorrow morning to see how things are going. Please post issues you find here please. Did anyone tweak the 64-bit software affecting Windows 10 Intel systems? If not, Microsoft did a number on themselves. I tried a Windows Solitaire Collection challenge while BOINC was running in the background. Solitaire app randomly aborted. When I suspended BOINC masnager, it still happened. 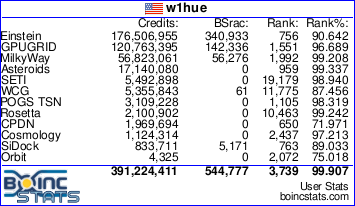 When I changed my account preferences and disabled BOINC use of the GPU, it still happened. When I restarted the machine without bringing up BOINC manager, Solitaire behaved itself. I exited solitaire gracefully and launched the BOINC manager. I usually pick on a game to test compatibility because this is where people get careless with getmains and freemains. Some even try to do recursive calls. I have not touched the Windows 64-bit application. Not sure why you are having issues with you solitaire application while running BOINC. ignor this post....it was a mistake and cant erase it.